Grind the ingredients mentioned under grind, adding just enough water to allow movement of blades into a smooth paste. Heat oil in a large heavy bottomed pan, add the ground mixture and saute for about five minutes, or until it turns dryish and the raw smell from the onions disappears. Add tomatoes and allow it to cook until it gets soft and mushy. Add the rest of the vegetables, salt to taste and water as required and allow to simmer until the vegetables are cooked. 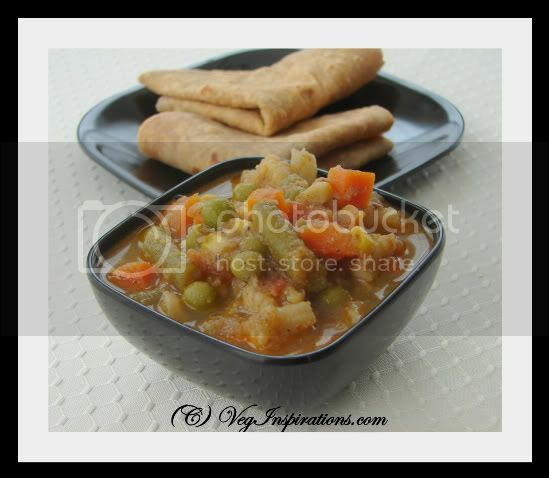 Serve hot with plain steamed rice, or mixed vegetable rice, parathas, rotis or puris.